This is the ultimate in unity. Choux pastry meets doughnut. Last year it was all about the cronut, this year- it's all about the chouxnut. This delicious treat is a doughnut shaped choux pastry bun filled with creme patisserie and topped with indulgent chocolate or salted caramel. Melt the butter and the water together in a 20cm saucepan until they boil. Remove from the heat and beat in the flour all at once with a wooden spoon. Beat until the mixture becomes a ball and comes away from the pan. Add the vanilla and then the eggs one at a time and beat well after each addition until the dough is elastic and shiny. Line 2 or 3 baking sheets with parchment, and using a 1M star nozzle or similar 1cm nozzle pipe rings 2-3inches in diameter to leave a good open circle. Use your piping bag in one hand and hold your scissors with the other. This way as you pipe the shape, you can snip just at the right point so you don't end up with blobs of the batter. Bake for 23-25 minutes (you may need to bake in batches) and then switch off the oven, propping open the door with a wooden spoon to let the pastry dry out for a further few minutes. Then allow to cool completely on a rack. Once cool the pastries can be kept for up to 1 week in an airtight box or frozen. To make the Crème Patisserie, beat together the egg yolks and sugar until pale, light and fluffy, then whisk in the flours until smooth. In a jug mix together the milk and vanilla bean paste then still whisking add this to the Egg, Sugar and Flour mixture. Pour this into a saucepan and gently bring to a simmer, stirring all the time until it is thickened and smooth. When the custard is really thick remove from the heat and beat in the butter. Transfer to a bowl and cover the surface with cling film to prevent a skin forming and allow to cool. To make the Chocolate Glaze, in a bowl over a pan of simmering water, gently melt all the ingredients together, stirring constantly until smooth and thickened. If the glaze becomes grainy beat in 1tbsp soft unsalted butter. The professional term for melting chocolate in a glass bowl over a pan of hot water, is a Bain-Marie. Make sure the bottom of the bowl doesn't touch the hot water as this can cause the chocolate to burn. For the Caramac Glaze, in a bowl over a pan of simmering water, gently melt all the ingredients together, stirring constantly until smooth and thickened. 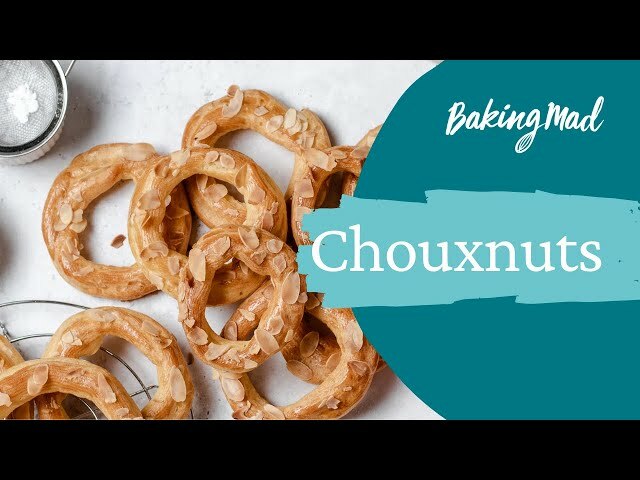 When you are ready to assemble the chouxnuts, carefully slice the pastry in half horizontally. Pipe the Crème Patissiere filling into one half and pipe a thin line of the caramel or chocolate sauce into the other half. Sandwich the two halves together. Then carefully dip the top of the chouxnut into your chosen glaze or paint the top with the glaze using a pastry brush. Top the caramel chouxnuts with flaked rock salt and the dark chocolate chouxnuts with freeze dried raspberries or sprinkles, or whatever you have in the cupboard!